The flagship Fifth Avenue FAO Schwarz store includes a room devoted to HABA products. HABA, the maker of high-end European maple and beechwood toys, didn’t subsidize this prime piece of toy real estate; the placement was driven by customer demand. 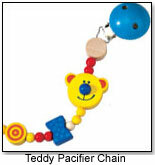 HABA’s top-selling Fidelia Rattle, Pacifier Chain Teddy and Check Your Height Tower have helped propel it to this enviable position. The ambitious company envisions itself as a single-source supplier for children and is currently expanding their product portfolio beyond wood products to jewelry, porcelain dishes and textiles—all of which are doing well. HABA’s parent company, Habermaass Corp. (ToyShow), based in Bad Rodach, Germany, imports and distributes European-made quality wood products. They export two other brands to the U.S. market, TOGU, which specializes in exercise balls and play balls for children, and Spielstabil, which specializes in high end plastic toys, like sand and water playthings, dish sets and more. National sales and marketing manager, Lea Culliton, recently promoted to vice president, has been a key driver in the growing popularity and success of HABA. Culliton began working with a HABA affiliate, then moved over to HABA three years ago. At that time, sales were stagnant at $1.5 million annually. Now, led by the infant category, the company’s sales have taken off. Culliton credits a diversified product line and sales in a range of retail outlets. “We’ve done well in children’s hair salons selling games, children’s jewelry and rattles,” states Culliton. 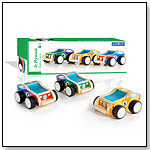 Boutique stores and gift shops that sell clothing and furniture are also adding HABA jewelry and toys. But everything that HABA has touched hasn’t turned to gold. Culliton noted that a hugging pillow that sold well into U.S. stores fell flat with customers. An analysis pointed to the European packaging, which didn’t appeal to American consumers. “We’re having new packaging designed,” says Culliton. HABA is also re-examining the packaging of other products. Board game packages that had been printed in French, German and English are being translated into English alone. This move has resulted in somewhat higher packaging and warehouse/shipping costs, but Culliton is convinced that it will result in increased sales. However, dual packaging models are required to satisfy certain American consumers, while not abandoning the boutique customer who prefers the European accent in toy purchases. Still, repackaging is only one of the company’s strategic moves. HABA is developing nearly 200 new products every year, leading the company to forecast a successful, increasingly profitable decade. Why? “Once someone buys HABA you become a HABA fan … [and then] go to HABA for other products,” Culliton responds. For a sense of the direction that HABA is taking, look to recent orders from high-end retailers Saks Fifth Avenue and Nieman Marcus. HABA is finding success in the specialty marketplace.